in Woburn, September 13th, at age eighty nine. 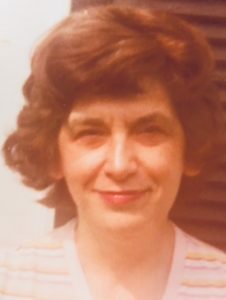 Beloved wife of the late Severio J. Restivo. Devoted mother of Rosemary Wybert, her husband Ron of Stoneham, Phyllis Dillon, her husband William of Millis and Jane R. Grant, her husband Bob of Tewksbury. Dear sister of Frank Senesi, his wife Sue of Somerville and the late Theresa Medieros, Gus Senesi, Alyce Tolle and Jeanne Senesi, also survived by her dear sister in law, Annie Restivo of Woburn. Cherished grandmother of Jean Dillon, Danny Dillon, his wife Caroline all of Millis and Bobby Grant of Tewksbury. Great grandmother of Luke Dillon. Also survived by many loving nieces and nephews and very special family friends Nan Quinlan of Woburn and Sharon Bryan of Hampton. A Funeral will be held from the Lynch-Cantillon Home, 263 Main Street, Woburn on Monday, September 17th at 9 a.m. followed by a Funeral Mass in St. Charles Church, 280 Main Street, Woburn at 10. Relatives and friends are respectfully invited to call at the Funeral Home, Sunday afternoon 1-4 p.m. Interment in Woodbrook Cemetery, Woburn. A Funeral will be held from the Lynch-Cantillon Home, 263 Main Street, Woburn on Monday, September 17th at 9 a.m. followed by a Funeral Mass in St. Charles Church, 280 Main Street, Woburn at 10. Relatives and friends are respectfully invited to call at the Funeral Home, Sunday afternoon 1-4 p.m. Interment in Woodbrook Cemetery, Woburn.